(ACN Newswire) - Blockshow Asia will take place at Singapore's Marina Bay Sands Expo on November 14-15th. As interest from investors starts to ramp up, the anticipation of finding the next big blockchain company begins to reach new heights. While it could carve out a path for a resurgence in the markets, it will be most interesting to see a new breed of experienced blockchain startups emerge. With speakers from across the financial, legislative and technological sectors driving the conversation, it will be an event focused on the most promising up-and-coming projects who weathered the last 14 months and emerged stronger. There have been many sectors in which startups have battled to the top but finance is not one of them. A large number are capturing some fractional market share but there is no hope for any to see the equivalent success which the likes of Amazon or Uber have experienced in logistics or transportation. Many of these "Emerging Disruptors", as Deloitte termed them, have instead chosen a more subversive tactic - building their business in a digital economy. Considering the cryptocurrency market of 2018, there seems to be a casual stoicism amongst the teams behind blockchain startups. Where one fails, another rises. These waves continue, steadily maturing in response to their peers' experience. It then becomes a new fight to get noticed. It's for this reason that massive conferences such as Blockshow have focused on giving these startups the chance to shine. Skipping to the present, this steady rise to maturity has come to be reflected in the slowly rising sentiment that, while the crypto winter may be more like that of the Seven Kingdoms, there's starting to be hope for spring, at least for some. While Zhao Dong's vision for 2020 is not to be taken for granted, there are many people who feel that the startups at the core of blockchain technologies have begun to emerge stronger, having survived the last 14 months of winter. As traders start to weigh up their chances in the options or derivatives markets, the number of attendees at blockchain conferences continues to grow. Investors are on the hunt. Not only for a new breed of startups but for all the information, skepticism, debate and digression which comes to rise in such places. 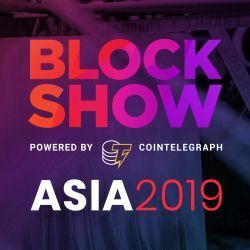 This year's Blockshow Asia alone, taking place in Singapore's Marina Bay Sands Expo from the 14th-15th November, will see speakers from a range of backgrounds reflect on what the blockchain has done, what it has promised, and how it has changed their perceptions. - Kenrick Drijkoningen; Nydia Zhang; Sinhae Lee; Cris Duy Tran; Matthew Tan; Jane Lippencott and more. Blockshow offers an opportunity to engage with industries or government bodies that are otherwise very difficult to catch for a discussion, be it about blockchain or related technologies. It is a conference offering a rare convergence of worlds. What's more, it sets a competitive tone which leads participating startups to bring out their Most Viable Product - what you see on the floor may be the culmination of everything the team's work has lead towards and the true unicorns will really make the opportunity count. Experience has made it clear that investor interest is still present and, if anything, more eager. While many have taken a conservative stance following the unfolding bear market, it is not a benign position. Having seen startups battle it out at last year's Blockshow, each pitching directly to investors in front of a live audience, it is clear that investors have the final say but it's up to the team to show their full potential. From Ethereum to 0x to Bitcoin itself, investors have observed the latent potential of cryptocurrency markets, waiting for something with staying power. A unicorn to outstay all unicorns, one to finally take a chunk of the conventional market. In greater number still, startups are under no illusion that they've been forgotten. With many having spent over a year blocking out the death cries of the media, there is little which could deter them from taking the opportunity to meet their potential business angel face-to-face. With the sector now infamous for scams, hacks and thefts, trust is, ironically, easier to come by. While over $1.7 billion was lost in the last year alone, seeing the team in-the-flesh and being able to grill them on every facet of their technology, coworkers, and operations, grants any potential investor the ultimate in 'DYOR', or Doing Your Own Research. This human element comes across in any business deal, of course, but when talking blockchain, there's another level of security: digital transparency. It's no secret that Mt Gox trustees have been liquidating funds to repay those affected by the hack of 2014, while with QuadrigaCX, chain explorers brought some insight into the nature of the company's losses. While it helps to be able to see past all the marketing and meet the company's representatives at a modest booth, being able to trace all their funding to date and see any undeclared investments is, arguably, an even greater asset.